Today, many of the Belize City Council's 172 sanitation workers were standing in line at the Holy Redeemer Credit Union, waiting for their end of September pay - which was due from last week Friday. But, sources tell us that the money just wasn't there because the council is struggling to meet payroll - since this is the time of the year when revenue dips the lowest. So, the money - almost a hundred thousand dollars - was not deposited at the HRCU, simply because the council didn't have it to deposit. "It's an incredible inconvenience for them and the complaint is that the city is unable to meet its payroll. How do you respond to that?" "Well, I would categorically deny that. The city did meet payroll. I know payroll was put in Friday. We have no control on the timeframe of how banks or credit unions process the pay, but I do know payroll was put in on Friday. I know you do have employees of the council who have gotten their pay. Soâ€¦ahm, I don't what's happening at the HRCU. Of course, sanitation is my department and I feel for the sanitation workers, and I hope that we can resolve it quickly." "We don't know what's the issue, but we can't be held accountable for the delay, or how long it takes a bank to complete a transaction or put the pay into their separate account, so we can't be held accountable. We know we did put in the pay." "But, at the end of the day, as the employers, youâ€¦the employee has the obligation to work as prescribed, but you have the obligation to make sure these people get paid. These people have had to go in hock to loan sharks, you know those rates, they are very usurious, they put the people in a bad situation that they won't ever get out of. So something has to be amiss at the city council, sir." "I agree with you they need their pay. Everyone needs their pay. You put in your work, you expect to get paid for it." "If something did went wrong on our part, we will immediately address it and fix it; if it's something on HRCU part, we will talk to them, and see how we will best fast track the payments next time so that we don't go through this, we don't have to put our employees through this pain." "I know we will have a difference of interpretation of fact, but I am quite reliably informed that City Council is in fact, struggling to meet its payroll and is offering people a 20% discount on their 2018 taxes, so that it can scrape together the funds to get an additional 40 or $50,000 here or there to put it into the account. Is that true?" "Well of course you know this is our low season. This happens every year. We have this discussion every year Jules with the media when the slow season comes, in the past it was about our sanitation companies and not meeting the pay for sanitation companies, we have not had that for donkeys years now." 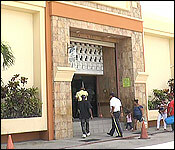 "We're at Tuesday and I'm told that right now at the HRCU they're still having hard time. Mr. Councillor, whether you want to admit or mask it in technicalities, the fact it the money isn't there - for whatever reason." "Wouldn't it be too much of a coincidence that this is your low season for revenue, and it's also the time when you cannot pay the sanitation workers, who are the people you used to not be able to pay, the companies, when they worked for a company in the low season. Isn't it obvious sir, you all are starved for cash and you just can't meet payroll." "We met payroll so what you are saying is a complete lie! We did meet payroll, I can take you to City Council and show you that we met payroll." "But the people didn't get paid." "We cannot be held accountable. You may so "oh we put it in late", if that is the case, granted and we will address that and we will change that, trust me." "Whatever it is we will fix it there's no need to get up in arms about this. It's something that can easily be solved and we will solve that. I can assure you that." "You don't need to get up in arms because you get your pay." "I don't know. Honestly, I don't know." 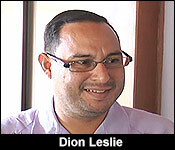 And while he flatly accused News Director Jules Vasquez of lying, turns out, Councillor Leslie doesn't have the facts on his side. And we know that because the Holy Redeemer Credit Union sent out a very rare and unusual press statement making it clear that they got no money for the city council payroll until midday today. It says, quote, "certain unfair comments were made about the HRCU regarding payment of salaries for the Belize City Council employees. 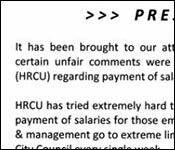 HRCU has tried extremely hard to work with the Belize City Council regarding the payment of salaries for those employees who are our member-owners. Our staff and management go to extreme limits to facilitate payment of salaries for the Belize City Council every single week." And, it concludes, "To set the record straight, we attach a copy of the check dated October third, 2017, that was delivered to our office at 12:00 noon today for payment of employees salaries for Friday September 29th." Boom! Just like that all the city council's protestations about it not being their fault evaporate rather quickly. But, the council still had a comeback: a responding statement from their press officer said: "we submitted payroll on Friday. What happened is the Council deposits payroll to its bank then the bank forwards payment to different financial institutions that employees bank with." 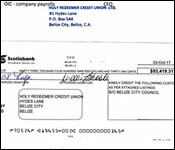 So, then, the suggestion is that the fault is with Scotiabank - which sent the cheque to the HRCU.